I use ON16 on a day-to-day basis, but keep checking back on the ONW10 version. When I went in today, I found the tag search was available. However, I found it still falls short. The search appears to based on the label for the tag. For example, if you use the out-of-the-box tag “Critical” (! ), you have to enter “critical” in the search box. So, you can search for custom tags but you do it by the tag label, not from a drop down of available tags. The implication here is that ONW10 does not differentiate between a box that is checked versus non-checked. In a previous post, we looked at how adding dates to tags allows viewing To Do lists sorted by when the action should be done. One way to take advantage of this is by using a preparation checklist. 25 days prior to the class: Send a quote for the class, reconfirming the class as originally scheduled. 3 weeks prior to class: Review any special requirements for the class, such as setting up scenarios in the training sandbox. In order to capture these in my daily plans, I use an Excel spreadsheet to calculate the dates, counting back from the class delivery date. In this case, B1 contains the class name, with the scheduled date in B2. Cells B5:B13 contain the lead times for each of the preparation tasks in column A. Cells D5:D10 rolls back weekend days to the previous Friday. Finally, E5:E10 simply combines columns C and A. 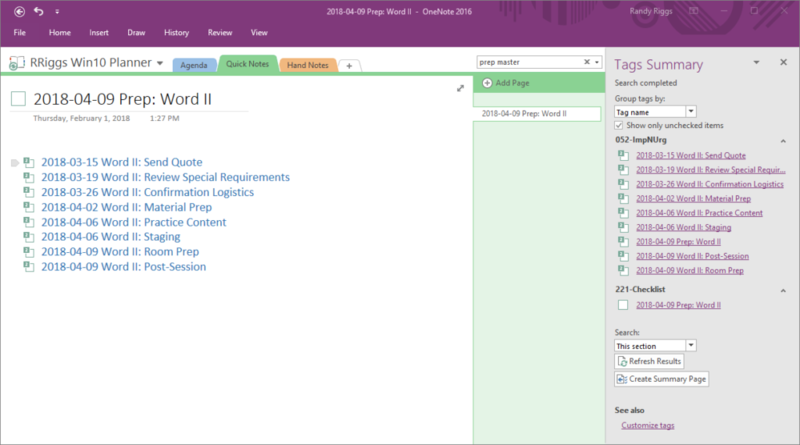 Once the dates are calculated, E6 becomes the title of the OneNote page. Cells E5:E10 are copied and pasted into the body of the page. I then add checkbox tags to each item. 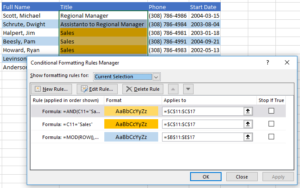 Opening the Tags Summary pane, the checkbox items are listed and sorted by date, with the first task in the sequence at the top of the list. As more classes are added, the Tags Summary builds to include all preparation items. This process minimizes the chance of getting so caught up in preparing for a class that the upcoming classes are neglected. I just read an blog post by Kate Starbird, regarding the Alternative Media Ecosystem. It makes me think of parallels with the challenges of Knowledge Management. Dr Starbird’s research looks specifically at crisis events and the networks used to distribute information regarding the events. Downplaying the nefarious players in the disinformation world, I do see a couple of parallels. First, the purpose of the entire news industry is the distribution of information, as is the purpose of knowledge management systems. Second, both systems have old school elements. For news media, it is the so-called mainstream media outlets. For corporate organizations, this is typically the training department. As well, both have alternative outlets for information. News media has blogs and e-zines, that operate with minimal costs. Corporate organizations have tribal knowledge – information held by those with practical experience. Right now, we are in an environment where the mainstream and alternative outlets are in many cases at odds with each other. This seems to be a cautionary tale to guard against the formal training organizations not acting as the Goliath to David’s informal networks. Neither wants to be accused of spreading disknowledge. It’s been a while since we restructured our OneNote to fit the ‘SecretWeapon’ methodology (https://thesecretweapon.org/). Overall, this has been a qualified success. As we come to the close of the year, and the start of a new one, it is time to take inventory of the past, and gaze into the future. Looking backwards, we started to see the impact the very large notebooks is having. In some cases, it has resulted in corruption of a notebook (very bad). Generally, though, where we see the practical impact is on mobile. It appears that anytime that OneNote does a full stop on a mobile device, it has to perform a reload of data. When we are out and about, and internet speeds can be choked, this can be quite a nuisance. In particular, it truly interferes with the “quick note” concept – that is, get things out of our head quickly and get back to what we were doing. Looking forward, Microsoft definitely talks to collaboration being the key to the future. As such, our notes should be available to anyone who would benefit from them. For instance, our notes on a specific project should be shared with the whole project team. However, if we are using the single notebook approach then we cannot share just a subset of our notes. So, these two perspectives – large notebooks are slow notebooks, and visible information is good information – require some deep thought on how to properly organize the OneNote environment. The biggest drawback is simultaneously the biggest strength of the ‘big notebook’ strategy: we don’t have to remember where we put something because Search is smarter than we will ever be. If we break up our big notebook and put the pieces in Team sites scattered across the ether, we have to tell Search all of the places our something could be. Further, we must load all of those notebooks into OneNote before we can search them. Ooof. In that spirit, we are going to use 2019 as another experiment – an experiment where we break and then try to renew the Keep It Stupidly Simple (KISS) rule. We will break out notebooks and put them up for display. While doing this, we will work on KISS strategies on how to find things when we need them. Author rriggstxPosted on November 28, 2018 Tags GTD, OneNoteLeave a comment on If it Ain’t Broke, Break it! Also of note, the example code for that section does not properly reflect the necessary code to reproduce the example. "class": "=if(@currentField == 'Done', 'sp-field-severity--good', if(@currentField == 'In progress', 'sp-field-severity--low' ,if(@currentField == 'In review','sp-field-severity--warning', if(@currentField == 'Blocked','sp-field-severity--blocked', ''))"
"class": "=if(@currentField == 'Done', 'sp-field-severity--good', if(@currentField == 'In progress', 'sp-field-severity--low' ,if(@currentField == 'In review','sp-field-severity--warning',  if(@currentField == 'Has issues','sp-field-severity--severeWarning', if(@currentField == 'Blocked','sp-field-severity--blocked', ''))"
"iconName": "=if(@currentField == 'Done','CheckMark', if(@currentField == 'In progress', 'Forward', if(@currentField == 'In review', 'Error', if(@currentField == 'Has issues','Warning', if(@currentField == 'Blocked','ErrorBadge','')"
Excel tables have a nice little feature that lets you band alternate rows to help visually read the data. However, to use this, you have to convert the data to a Table. 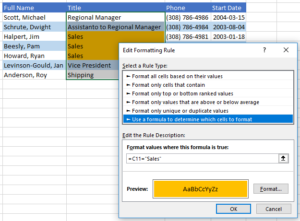 Since this is not always practical, there is an alternative using Conditional Formatting. 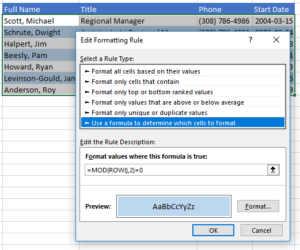 This applies the formatting you choose only to those rows that when divided by 2 have no remainder, i.e., even numbered rows. This is especially useful in preventing the shading from go all haywire when the user deletes a row. 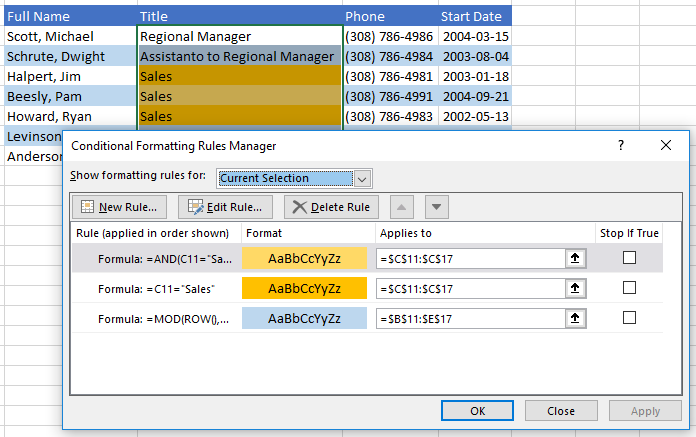 But what about conditional formatting on larges swaths of cells that hampers banding? Easy enough. You can combine formulas to make the conditions still work with banding. Quick tip: The banding with condition formula needs to be above the condition-only formula, with the standard banding formula at the bottom of the conditions list. This gives you conditional shading that is continuous with the underlying banding across the full data set. I had the chance to speak with Dr. José Roldán last week, at the Universidad de Sevilla. We discussed a paper he co-authored last year studying the impact of Cultural Values on Organizational Agility. Looking at these, the first three would seem to be conducive to agility. The Clan culture has a focus on sharing knowledge across the organization would be an advantage in responding to change. Adhocracy’s leveraging innovation makes change critical to their success. A Market culture has an external focus that allows it to recognize change in its earliest stages. The highly formalized and regulated structure within a Hierarchy culture should make the organization the least adaptable to changes. Surprisingly, the research found that the Hierarchy culture actually had a positive effect on the organization’s agility. It may be that the stability offered by the culture is beneficial during times of crisis. The top-down approach allows the organization to respond faster than “management by committee”. These reminds me of something I read about how special ops teams plan and execute. During the planning stage, the group is flat – each expert brings their talent to the forefront. Once the team begins to execute, the group has a single leader to avoid conflicting instructions at critical times. Felipe, Carmen M., José L. Roldán, and Antonio L. Leal-Rodríguez. “Impact of Organizational Culture Values on Organizational Agility.” Sustainability 9.12 (2017): 2354. Last year, Microsoft released To-Do which was derived from Wunderlist. The promise was all to-do’s in one place, a focus on today’s activities and integration with Office 365. I looked at it as a possible bridge for OneNote Windows 10 while that version of OneNote awaits tag search. What I found was much to-do about nothing. To-Do offers a quick snapshot of the Tasks residing in Outlook. Since the Tasks actually exist in Outlook, additional functionality can be found in Outlook (e.g., sorting and filtering). My Day does allow the user to focus on just what you have chosen for today. No reporting on the past dates. 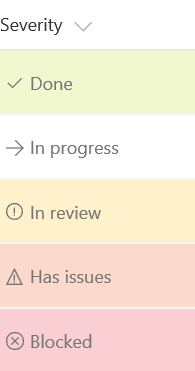 For example, if you want to review last week’s tasks for completing your time sheet, you can’t do that in To-Do (but you can do that in Outlook). Although it can sort, the sorts available just are not that useful (but again, you can do it in Outlook). To-Do task notes cannot include links, such as to your work notes, or a relevant web site (wait for it – Outlook!). So, To-Do offered no functionality or features that were not already available in OneNote. Using To-Do means opening another window and scattering information across multiple applications. This seems to go against the rule of Keeping It Stupidly Simple. Of course, what makes OneNote useful is being able to refer to your notes anywhere – from your office, from home, or even during a meeting at the client site. To do this, you need to store your notebook on OneDrive. Your OneDrive account can be tied to your personal account, or to your work account. There are pluses and minuses for both options, so take a minute to figure out which works for you. Personally, I use my work account, since that is what I sign into on my work machine. To use OneDrive, right-click on the Notebooks listing towards the top left. From the drop down, choose properties. In the Notebook Properties window, you have the option of changing the location of the notebook. If the notebook is not already there, use the Change Location button to navigate to your OneDrive. Now you can access OneNote from your iPad or phone, as well as your main desktop machine. In a previous tip, we said that we only use tags for verbs (actions). So, how do we find all the notes related to a client? Or notes created while in Connecticut? And what about that trick we learned about moving pages around in SharePoint? This is where the OneNote search function comes in handy. As opposed to tagging these items, we take advantage of Search to find nouns. For example, if you use a code to identify projects, you can search for that project code. The search results will show all notes in currently open notebooks that contain that code. You can also enter someone’s name, which brings up all notes with that person’s name. This leverages the Meeting Notes feature, which includes the invitees to meetings. Thus, any meeting attended by that person will show up in the search list. Here is a mini-tip: If I fail to find a note after two searches, I make a list of the searches I used. Once I find the note, I add the keywords from the failed searches to the note. This makes it more likely that I will be able to quickly find the note next time I go looking for it.